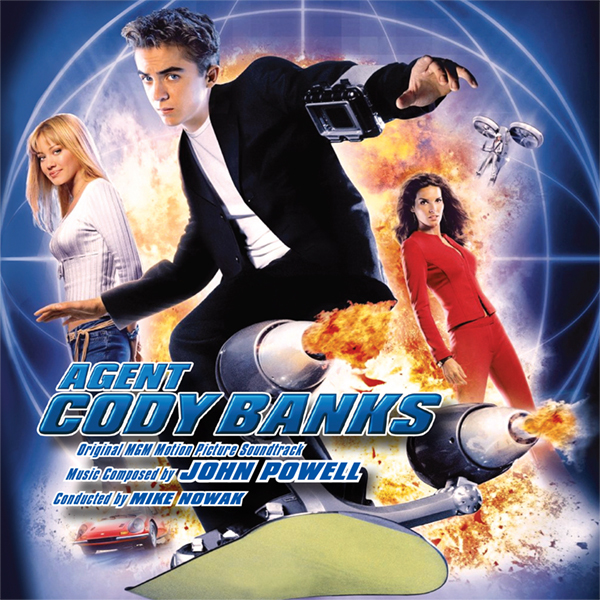 The 2003 MGM film Agent Cody Banks features composer John Powell at the musical helm of this CIA-trained high school secret agent with the cool bravado of a super spy and the angst of a teen boy who was trained to fight but not to talk to a girl. No stranger to the world of intrigue, the composer who adorned the Jason Bourne films with rhythmic action created a score capturing Cody’s blend of assured physical moves and absolute verbal awkwardness. It required a musical personality that resonated from a stalwart hero theme to punchy jazz riffs, gripping doomsday-countdown suspense and a lushly assured melody for the fashionably sinister ERIS. Agent Cody Banks is far more than a retro Bond pastiche however, especially when it comes to playing a character caught between the CIA and civilian worlds, and a gawkylooking kid who isn’t nearly the ladykiller he’s cracked up to be. Subsequently, Powell mirrors every “serious” theme with a humorous counterpart, thus reflecting the two sides of Cody Banks. His teen-awkward “hero” melody is propelled by a finger-snapping groove. At the time of the film's release, a CD sported just two score cuts amongst a barrage of vocals. Some twelve years later, Intrada unleashes a CD packed-to-the-limits of playing time featuring the complete score. In the film, Frankie Muniz plays Agent Cody Banks, assigned to spying on fellow student Natalie Connors (Hilary Duff) in order to get close to her father, a scientist who has invented killer nanobots designed to bring down the country. Saving the country from killer nanobots -- easy. Talking to Connors -- highly challenging. Just Announced! It's a secret, so don't tell anyone... spy life is never done!